Here’s my quickie post to let you all know that I’m going to be missing for about a week. Hubby and I are leaving on Monday for a “mini” cruise to celebrate our 4th anniversary. It’s nothing exotic at all, especially if you’re living in Southern California, but for the curious we’re sailing out of Los Angeles Harbor and will be stopping in San Diego, Catalina Island and Ensenada, MX. 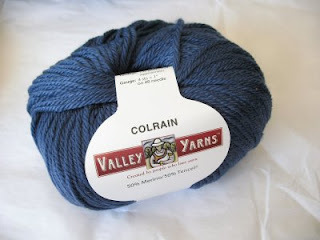 In Stash Enhancement news (because I seem to have that quite frequently lately) I received a 33 skeins of Valley Yarns Colrain from Webs to knit two sweaters. I’ll be knitting DH the EZ Seamless Hybrid in Majestic Blue with Steel Gray trim on the inside cuffs. For myself I’ll be knitting the Radiance Cabled Jacket (Ravelry pattern link) in Chestnut. I really want to start on mine first, but since I’m almost finished with the Tangled Yoke Sweater, I should probably treat him to something next. Then again … maybe I could knit them at the same time? Hubby and I went over to our local bookstore Thursday night to pick up a book a friend recommended (Fibromyalgia for Dummies) , but while I was there, I ran across a 50% off table of craft books. 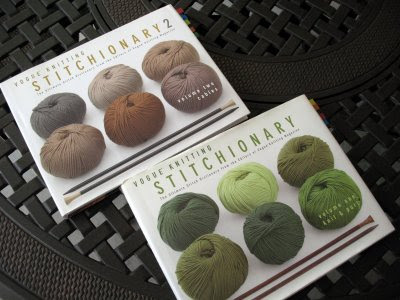 I got lucky enough to pick up the Vogue Knitting Stitchionary Volume 1 and Volume 2 and have found some design inspiration for a scarf. I’ve test swatched it in a few worsted weight yarns, and so far it works well for solid and multi-colored yarns. Since I’ll be knitting it on my mini-vacation, hopefully I’ll have some cruisin’ photos, knitting photos, and a scarf pattern for you all when I return. And one last thing before I forget, you MUST go look at Laura‘s stunning South Seas Stole she designed. I can’t wrap my head around all the work that must have gone into the design of this, but it is definitely something I’m thrilled to be test-knitting, so watch out for more lace work here soon. I think it’s time to close the PayPal account and hand my credit card to DH. Since I have had some health problems lately and don’t have a lot of energy to be out and about, I’ve spent a lot of time inside sleeping, watching movies, a bit of knitting and online shopping. Yesterday, I received an order from The Loopy Ewe, today I received an order from KnitPicks and then today I placed an order with Peaches & Cream (which is the fault of today’s post from Amy). First up, yesterdays delights from The Loopy Ewe! Two skeins of Lorna’s Laces Shepherd Sport in camouflage, a skein of Louet Gems in white, and The Loopy Ewe tote. The tote is definitely larger than I’d expected and will easily carry my current sock project (or two). Since this was my second Lorna’s Laces order, there really wasn’t much oohing and aahing although the camouflage color will be perfect for DH. I must confess that the favorite part of the order was the Louet Gems sport weight yarn. It’s obviously not due to the color, but the yarn feels amazing! I’ll probably be casting on with this yarn next. It’s too tempting not too! What’s not pictured is a skein of Lane Borgosesia Cashwool in Red, because it’s being returned. Not because the yarn isn’t absolutely fabulous, but because I do not like the color. It looked like a true red on my monitor, but when I received it, I thought “ICK, that looks like neon red”. The Loopy Ewe has a wonderful return policy, so I’m mailing it back to her tomorrow. Today, from KnitPicks, I received their lace weight Shadow yarn in Sunset Heather. I also ordered lace blocking wires, but for some reason they didn’t arrive with the yarn. Oh well, it’s much easier to fondle yarn than blocking wires. I was hoping the yarn would be good, but I was honestly surprised at how nice this yarn is for such a low cost. 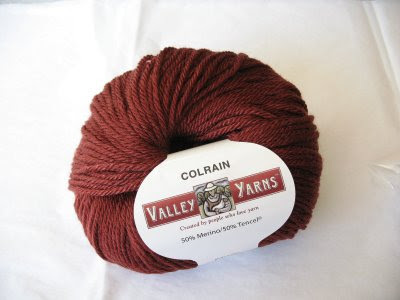 I purchased 3 skeins of it which totals to be 1,320 yards for only $7.47. I’m not sure what lucky shawl pattern I’ll choose, but whatever it is, it won’t matter since the yarn is so lovely. Obviously I’ll show you what I ordered from Peaches & Cream when it arrives and obviously I’m planning to knit a dishcloth or two (or three or four). The grandkids had their last itty bitty t-ball game on Sunday. It was played at the Lake Elsinore Diamond where the Lake Elsinore Storm plays. 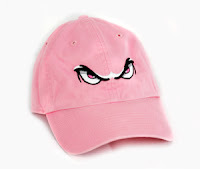 The Storm is not only the farm team of the San Diego Padres MLB team, but I also discovered that their logo is the best selling logo worldwide for the New Era Cap Company. After the kids game, there was a break to give the grandkids their medals and grab a bite to eat before the Storm played their game on the field. Since the grandkids sold the most tickets on their team, they each got to accompany one of the players out on the field before the national anthem. Since it was miserably hot that day and #2 didn’t get his nap, he was a bit too grumpy to do this, but #1 was out in left field with his hot off and over his heart. So cute. Too bad my camera couldn’t capture it since he was so far away. Must be time to ask DH for a new camera. During all the waiting around between each game, I got in some great knitting time on my socks. I believe this is my first Knit in Public photo. DH looked a bit puzzled when I asked him to take this photo, but then he obviously decided not to question a woman sitting in 80+ degree temperatures with pointy needles. Did I hear you just ask what’s on my needles? (Or, were you cursing me for not telling you what I ordered?) Well, not pictured is the Handsome Triangle Scarf and the Matinee Coat because there’s not much of a change in either. I just cast off a square for Julie and it’s currently blocking although I don’t have a photo of it. I did start a sock though! I know, you’re not surprised. I mean, how could *I* not have a sock on my needles? This is Cherry Tree Hill Supersock yarn in the Green Mountain Madness colorway and I’m knitting it into the Snake River Socks pattern. I love the yarn, I love the pattern, and I think I may give these to my mom for Mothers Day. After all, she does live next to the Snake River. I also received my order from Sundara Yarn. I ordered this sock yarn back in March and had honestly forgotten about it so it was a very nice surprise to see Mr. Mailman bring me a package. I ordered this yarn for 3 reasons. 1.) She lives in the city I was born and left my heart in: Seattle, Washington. 2.) The yarn is named after one of my most favorite trees: Cherry Blossom. 3.) 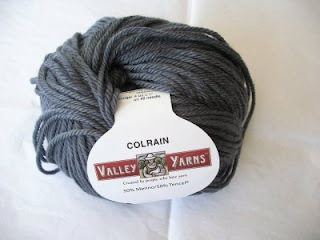 Her yarn always sells out and I was curious to see if the yarn is as good as I’ve heard. Although I haven’t knit with it yet, I can say that I’m very thrilled with my purchase even though with the shipping and handling costs, I doubt I’ll order very often from her in the future. We’ll see if I still say that though after I knit with it. I also received the sweetest surprise from Entrelac. I was commenting to her that I needed a contrasting stitch marker so I could identify the center of my shawl and before I knew it, I had this beautiful blue Swarovski crystal marker in my mailbox. She even sent me this one from her personal collection … for free! I am in love with these dangle free stitch markers and I’m definitely impressed by Ana and her amazing turnaround time and customer service. Inspired by Teyani’s post, here’s “my knitting spot”. This is where I usually sit to do all of my knitting. DH and I have been married for almost 4 years, and the first 2 1/2 years were spent sitting on the sofa next to him. However, when I learned to knit, I then discovered that this chair was more comfortable than the sofa, so I moved and poor DH has had the sofa all to himself. He probably prefers it though since when we used to sit together and he’d start to doze off, I’d tap him to wake up. Now he’s across the room and when he dozes off to sleep during a movie we’re supposed to be watching together, I just ignore him and keep knitting. He gets his beauty rest, and I work on my knitting. We’re both happy. I love the anticipation of waiting every day for the mail when you know you have something arriving, but when you get two items in one day, it’s difficult not to hug the mailman. After receiving my first order from The Loopy Ewe, I now know why everyone loves Sheri so much! I had a difficult time narrowing down my yarn choices on her website, but I let Project Spectrum be my guide and I stepped out of my comfort zone to purchase only yarns in shades of green, pink and yellow. I also decided to try out some new yarn companies. I mean, how can you say you adore Socks That Rock if you’ve never tried Fleece Artist or Lorna’s Laces and such? Not only did I receive my order in just a few days of placing it, but everything arrived packaged beautifully. The skeins of yarn were wrapped in white tissue paper and finished off with The Loopy Ewe seal. In addition, my invoice included a personal handwritten note from Sheri as well as needle inventory cards and small sample yarn cards of Regia Silk and Regia Bamboo. I will most definitely be purchasing more yarn from Sheri in the future. On the same day, I also received another set of 10 stitch markers from Team Entrelac. They arrived just in time since I’ve started my next (first?) lace project. It’s hard for me to put into words how ideal these markers are. There’s not a single open gap or rough edge (burr), so I’m not scared of it snagging the delicate laceweight yarn, as other makers have done before. I also love how beautiful each tiny bead is, so it looks like jewelry for my knitting. You also can’t beat the price or the speed at which she ships! Both my orders arrived on my doorstep in less than 48 hours! It seems that she doesn’t have a lot of her stitch markers on her etsy site since she’s trying to open her own storefront, but you can see all of her stitchmarkers here. Go ahead, take a peek, she makes them in ALL sizes! I finally decided on a pattern for the dark navy Grignasco Regina that I purchased when I was with Laura at our LYS. The photo shows the beginnings of A Handsome Triangle (page 32) shawl from Victorian Lace Today. So far, I’ve completed 80 of the 212 pattern rows and since it’s a triangle shawl knit from the bottom point up, I increase four stitches every other row, so progress is just starting to feel slow to me. I’m probably being either daring or stupid for jumping right into an intermediate pattern for my first lace shawl, but if all goes well, this should be a nice present for my mother-in-law (mum) for her June birthday. DH & I entertained ourselves for a few days by finally adressing our landscaping problem. The sprinkers were all checked and broken ones replaced. New sprinklers were added to two areas that only grew dirt. 5 palm trees were added (2 in the backyard and 3 on the side yard of our corner lot). Last but not least, half the backyard was re-seeded for grass, since the dogs tore up the old pathetic grass that used to be there. This is just the beginning though. Hopefully soon (after recovering from all the money those palm trees cost), I’ll be adding all sorts of blooming plants.